Ansonia Clock Co. "La Vinda", Royal Bonn, ca 1901. 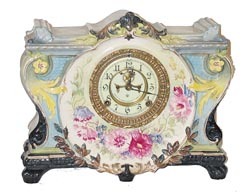 Another extraordinary porcelain clock from the collection of an elderly gentleman who had collected 40 years, and it became time to disperse his clocks. He probably bought this one late in his collecting days, because he didn\'t clean and shine it before putting it in the display case. Other than 1 small dial hairline, I can\'t see anything here other than perfect. All his clocks were running when he put them in the display case, but some probably haven\'t been wound in 30 years. You know they will need oil and maybe a jump start to get going. This is a seldom seen case style, and a large case standing 14 1/2 inches high and 11 1/2 inches wide. There are a great many colors, hard to distinguish some, or even give a primary color. There are yellows, blues, greens, pinks, and many shades of many other colors. There is just a smidgen of gold, mostly on the base. 8 day, gong strike, Rocco sash, beveled glass, 2 piece porcelain dial and open escape. Ly-Ansonia No.2550.